You’d have to have your aesthetic sense surgically removed not to find the Meteor Bentley impressive. There’s that pristine, polished engine for a start, a 27-litre derivation of the legendary Merlin unit that once propelled Lancaster bombers and Spitfires. A classic Bentley went on sale in 2012. It is beautiful and powerful, but it was expensive. The aesthetics of the car will make everyone turn to look, but so will the cost of fuel to make this beauty run. 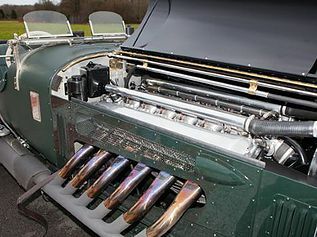 This car is equipped with a 27-litre V12 Rolls-Royce Meteor engine. Bob Petersen is the engineer who spent three years designing the impressive Bentley Meteor. It was even featured in BBC’s show Top Gear in March, 2012. When it rides smoothly on the road, you can barely even hear it. Despite its classic design, this Bentley is 100% legal for the road, and it was for sale price at a hefty sum of £500,000. The vehicle is demonstrative of impressive British engineering. The lucky owner need not have any concerns about the quality of the build. This masterpiece comes with an incredible 850 brake horse power which is more than any other Bentley ever built (similar to a Formula Race One racing car). It is a result of famous Crewe car maker. In order to start the vehicle, the driver must turn the twin magneto switches. This comes from a Lancaster, and then the driver pushes the ex-Spitfire starter button. Instantly you will feel the 27 litre V12 engine kick into gear. This 19 foot long car is extremely powerful, and can reach speeds up to approximately 160 mph (estimation). However, the drawback lies in the lack of fuel efficiency. 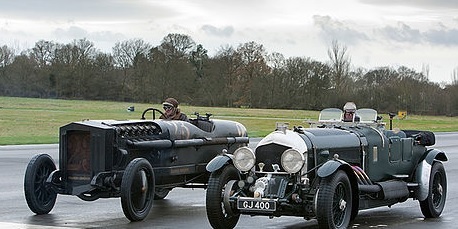 This classic Bentley only gets two to three gallons to the mile. Bob Peterson, runs Bob Petersen Engineering in Devon, and recognized that an avid user would be forced to live at the gas station. Therefore, he equipped the vehicle with a 400 litre fuel tank! The owner may have fewer trips to the pump because of this feature, but do the math. In order to fill the tank up completely, be prepared to shell out around £550. This engineer also used a 1930 Rolls-Royce Phantom II to harness the power of the car. He wanted this new model to maintain the look and feel of a vintage Bentley. This required intensive attention to the design of the coachwork. Building the car with a modern touch was also part of his plan. Features such as power steering and powerful disc brakes facilitated more control over such a powerful engine. While the car made its appearance on that BBC Top Gear episode, Jeremy Clarkson compared it to a German car that was equipped with an engine from a BMW aircraft. Peterson had originally built the car specifically for a customer, but it ended up being put up for sale by classic car experts Coys. One of the salesmen who work at Coys (Dan Zuckerman) describes the car as unique, and a brilliant depiction of British engineering at its best. The car is being described as a once in a lifetime vehicle by many. It is a direct result of the disciple, dedication and vision of one man. Peterson has shown a love and appreciation for unique and high quality. There was great satisfaction in building it, and he thoroughly enjoyed driving it around for over a year. But now Peterson is excited for his next project.